Salvador Díez Lloris, President of the Colegio de Valladolid since 2005 and of the Consejo Regional de Administradores de Fincas de Castilla y León since 2006, was elected President of CEPI's Spanish member association CGCAFE (Consejo General de Colegios de Administradores de Fincas) in October. Born on 19 August 1962, Salvador Díez graduated in business science and property management in 1992 and is a professional with extensive experience in the real estate sector. 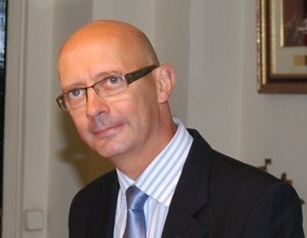 As President of the Colegio de Valladolid and of the Consejo Regional de Administradores de Fincas de Castilla y León, he initiated lifelong learning courses and workshops for property managers, and fought to defend consumer rights through the delivery of the highest quality possible professional services. His objective as newly elected president is to promote proper professional, institutional and social recognition of the profession, placing consumer interests at the core of the property management business, to ensure the future of the profession. On behalf of all members, we express our heartfelt thanks to CGCAFE’s Past President, Miguel Angel Muñoz Flores, for the time he dedicated to us and for his contribution to the CEPI network. Find out more on CGCAFE's website (in Spanish).